I am blessed to sit for my less than a year old granddaughter in the mornings. It is different than mothering. I look back and when my kids were young, life was filled with many mundane chores. I didn't have time for anything but the basic cooking. My first child spent the first three months crying day and night. Only if I walked with him did I get a break. I was exhausted. In the following months, I was learning and missed some of the fun growth. After that as we were blessed with more children, I did not have time to watch for every nuance each child did and was thrilled with the biggies, turning over, sitting up, standing and walking. The funny little actions may or may not have been seen. After my fourth, I was teaching, and the day only got busier. I did only teach afternoons because even then, I knew, I did not want to be cheated out of seeing my precious ones grow. It still is not the same as not having those responsibilities and taking care of a baby. I spend most of my time with my granddaughter when she is with me. I feed her, change her, talk to her, play games with her, read books, look at pictures and sing songs. I rock her to sleep in my arms and keep her there. Typical Bubby spoiling the chilld and more so, loving her. As a result, I note when she imitates a sound, initiates a hand motion, eats a new food, learns a new skill and loves a little more. I got her a new toy today and let me clearly state, I am not into lots of toys. I see how much she likes any object around from the tissue box to the cell phone. When we set up our home with a baby area, I got her cloth books, a musical toy, a baby doll, a ball and brought down a stuffed toy, I keep on hand for the other grandchildren. She loves music and that is what she goes to first. Her baby doll is her baby and she knows to make nice to it and open and close her eyes. I think she likes the tissue box as much but I don't let her play with it because she empties it out, one by one and throws each piece on the floor. I replaced it with a kitchen container and a few blocks. She could do the same thing but she is smarter and instead fills the box and empties the box and refills it. I noticed, she imitates sounds. She has a clicking sound for the phone (that is a real wall telephone - a land line). The new toy has balls that go down a circular shape and with that she started to go "bop, bop." I am not sure, I would have picked up on that bop bop if I wasn't sitting on the floor with her. It is the little things that are the most endearing. I am on fortunate Bubby. What does this have to do with zucchini? Absolutely nothing. Although, I gave her eggplant for lunch and my daughter was appalled. She hates eggplant. Well, the little one doesn't. Is that why grandparents are so important? We open doors like eggplant that might never have been seen through. Anyway, I made this zucchini, simple and good to eat. Since I am serving this with chicken, I left off the cheese. I would suggest that you do use the cheese. I can imagine that it would give this dish that extra oomph. Brush 1 teaspoon olive oil on the bottom of an 8 by 8-inch baking dish. 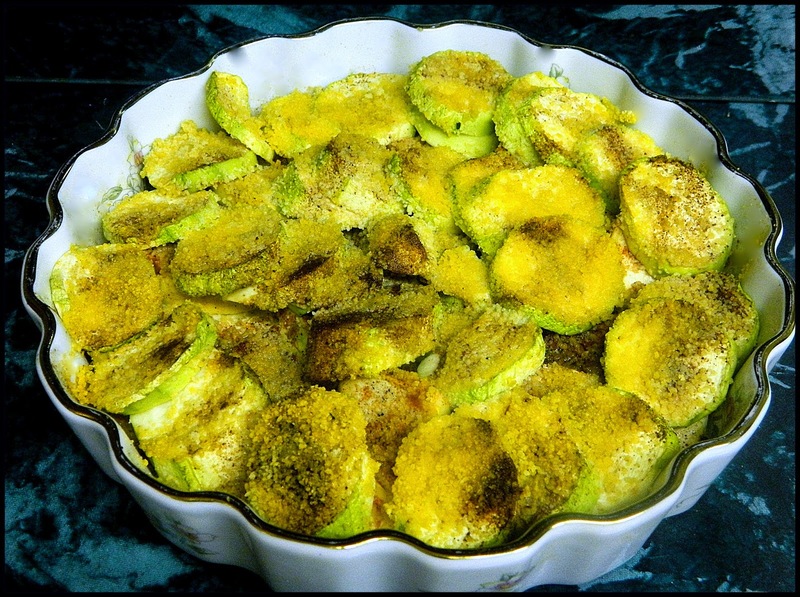 Arrange the slices of zucchini in the dish with an overlapping pattern in rows or a spiral in a pie dish. To make the topping: In a bowl, stir together the panko breadcrumbs, thyme, Parmesan cheese and season with a sprinkle of salt and a few grinds of pepper. Add 1 tablespoon olive oil and stir until all the breadcrumbs are soaked with the yellow tint of the oil. Sprinkle the topping evenly over the dish and bake until the top is golden brown, 30 to 35 minutes.